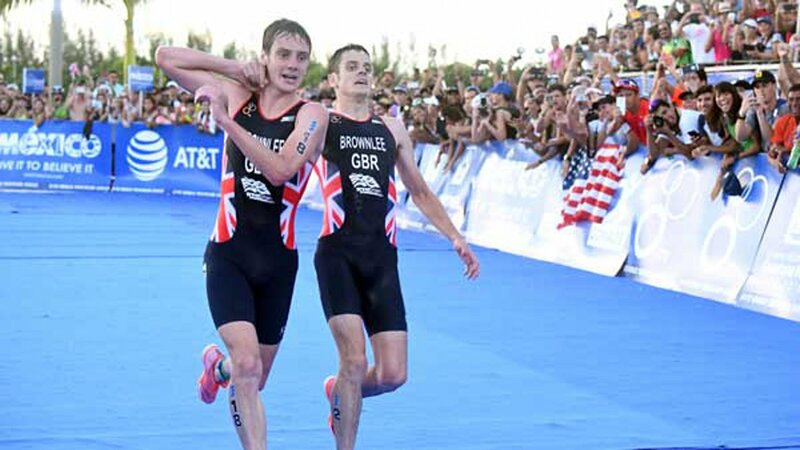 Cozumel, Mexico -- Jonny and Alistair Brownlee give a whole new meaning to the phrase "brothers in arms." On Sunday, the British athletes finished second and third at the World Triathlon Championships in Mexico after a touching moment at the finish line. Younger brother Jonny, Olympic silver medalist from London and Rio, was leading the field coming into the final straight and looked set to clinch his second world title. But with temperatures reaching 30 degrees Celsius on the Caribbean island of Cozumel, exhaustion rapidly set in. At the point of collapse, double Olympic champion Alistair arrived on the scene to give his brother a helping hand, putting an arm around his shoulders and hauling him over the line. "I wish the flipping idiot had just paced it right and won the race," Alistair joked with reporters after the race. "He could have jogged that last two kilometers and won the race. "You have to race the conditions. I was comfortable in third. I raced the conditions, I took the water on, made myself cool and I was all right." Pushing his younger sibling over the line first, Alistair recorded a third-place finish but Jonny's second place wasn't enough for him to clinch the title, losing out on the overall crown to Spaniard Mario Mola by four points. Jonny collapsed to the floor immediately after crossing the line and required urgent medical attention. He later tweeted from a hospital bed that he was fine and praised the efforts of the British Triathlon medical team. South Africa's Henri Schoeman claimed victory on the day, as Rio 2016 gold medalist Alistair finished the season 10th overall. It wasn't the first time the pair had shown brotherly love upon crossing the finishing line, after sharing an emotional embrace while laying exhausted on the floor in Rio. "It was a natural human reaction to my brother," Alistair added. "But for anyone I would have done the same thing."